I finally have the last piece of the puzzle that is my Plan sorted out. Kyuquat Wolf Brothers Regiment in training. I finished painting my Rosmark Provincials this morning. Just need to finish the bases and design a flag. With the baseless lads lined up shoulder to shoulder on my gaming table I was once more bemoaning my current lack of any reasonable, all arms, 40mm, horse and musket, force of reasonably sized but compact battalions for teasers and the like. While doing so, I opened the drawer full of Lost Bases to get..something, anyway I noticed a stack of removed bases and hauled them out to see just how many there are and if I could think of something to do with them. 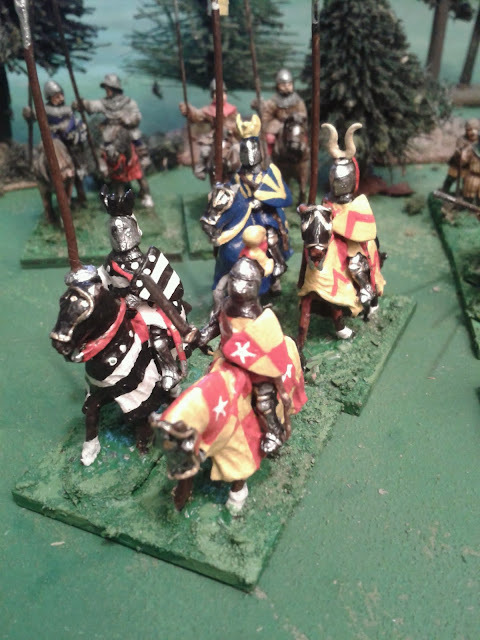 The 45mmX45mm bases will nicely hold 6 of the Prince August figures and three such will fit in a 6" grid square, but more importantly, if deployed with reserves in a second line I could field up to 12 such battalions on my current table plus cavalry and artillery in proportion. The new Provincials gallantly stepped onto the bases to prove that six will fit comfortably but they are pledged to be singles on a wider base. Glancing up at my shelves I noticed the ragged horde of half-pay Faraway troops. Troops that I want back in action once I figure out what that action should look like in a world of no duplication. Then I looked at the bases and remembered that they originally held 6 of the Faraway and Oberhilse figures organized into 3 stand battalions. I also remembered that I had disbanded the 1840's Oberhilse troops and slotted many of them into the early 20th C collection. Then I remembered my plans for a Colonial-ish Faraway game once I figured out what it would look like. AH! I even had a few castings on my desk to start the regular portion of the Kyuquat army. AHHA! This had been going to be my Not Quite the Mex-Am/Sikh or Indian Mutiny War but had stalled, partly to work on other things but also because I had wondered whether it should be a "normal" OS battle game or should be a semi-skirmish game. I have the skirmish game now, as part of the NQSYW so it can proceed to be my 40mm conventional OS Battle wargame that fits on my table, as originally envisaged. This sort of thing. A cobbled together rules test from 2015. 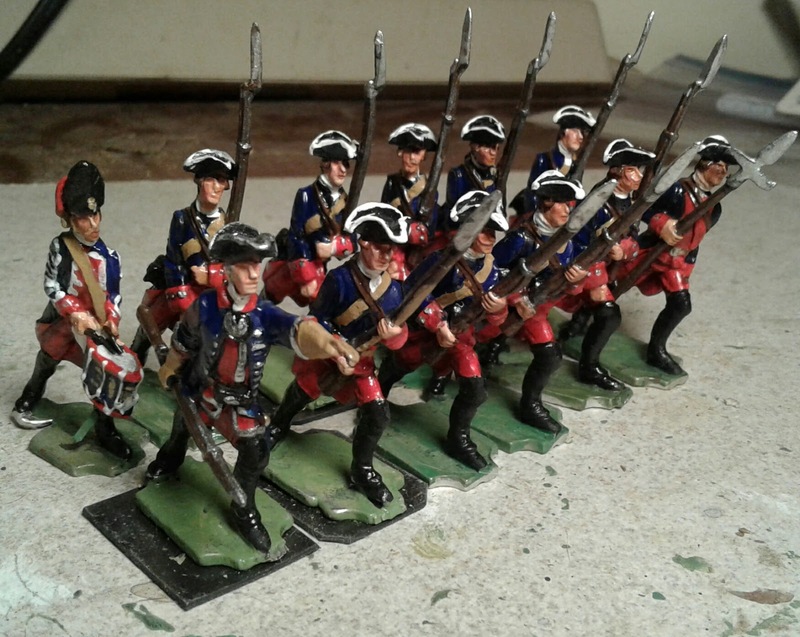 I have enough "ready to play" Redcoats for now so the focus will be on sorting out the native forces. I will do two Zinnbrigade native battalions in white coats and shakos. I now have an Oberhilse "European" volunteer battalion all based up, still wearing a mix of their old uniforms, and will cobble some irregulars again from Indians and the Brethren. That will be enough to start though it'll take a few weeks to get it on the table. 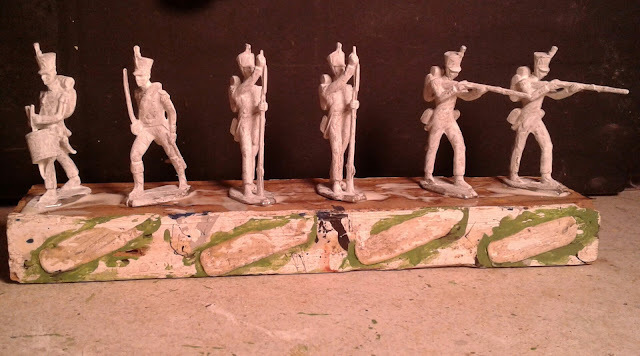 If I rebase the temporarily based 1812 figures to match I'll be able to get a game in even sooner and prove the theory. That will be the last loose end tightened down! Eight active Collections. For those who don't follow my Gathering of Hosts blog I've been distracted by setting up and playing my first 25mm Medieval/Fantasy game in over a year. I may have lost my Ancients mojo but I still like pointy sticks! Under the premise "Strike while the iron is hot" I passed some time today sitting under a patio umbrella on a hot summer's afternoon, contemplating command rules for my ACW games. 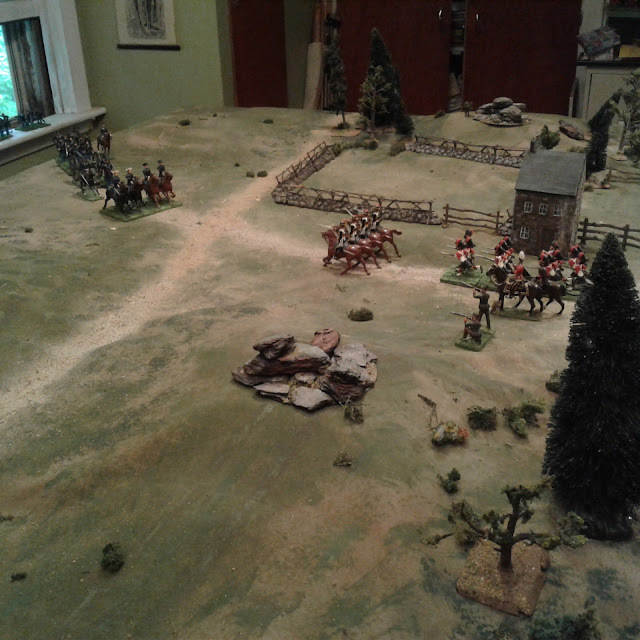 Kinch's Charge sets out 4 years ago. I've tried various familiar techniques such as activation rolls or charts, card draws, command point rolls, command radius, written orders, mapped movement and more and they all had something to contribute but yet didn't quite do it. 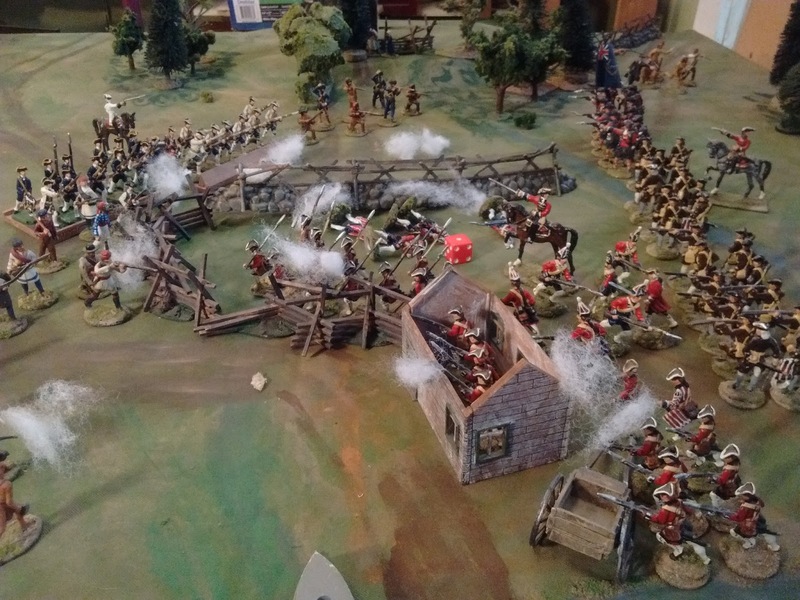 They reduced player control but usually felt "game-y" and often did a poor job of both modelling how things were done and reproducing typical historical battlefield behaviour. Even worse they often absorbed so much time and mental energy that the focus shifted from the battle to the game mechanics. Colonel Lawford and Brigadier Young, who both had considerable experience of command in battle with all that entails, relied on a combination of simultaneous written orders and highly variable combat results to represent the uncertainty of battle. I'm not sure that either my reading or my life experience gives me a solid basis for saying they were wrong, especially at the battle rather than skirmish level. Certainly the Charge! games I have played in or run have seen some of the most unexpected command failures, errors and omissions as well as some notable moments of recognizing and seizing sudden opportunities that I have seen (not to mention misleading the enemy). Unfortunately the system does not lend itself well to solo games with 40 units on the table. 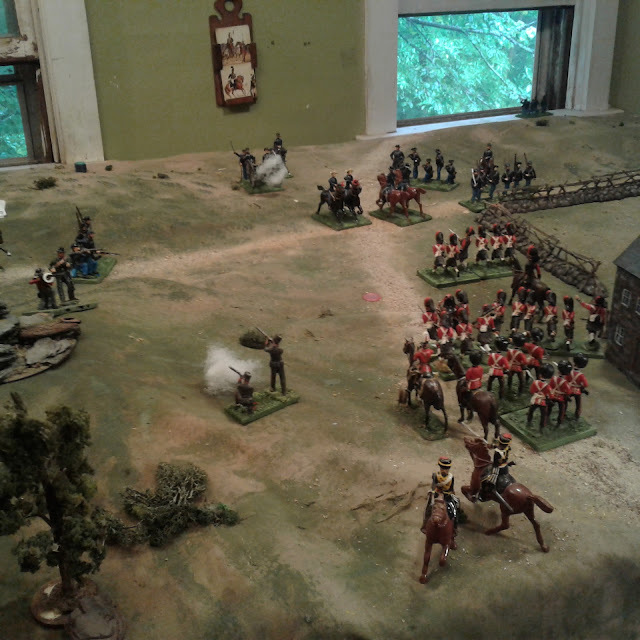 The impromptu ACW game that I played in May relied on variable length moves at Brigade level with provision for Division Commanders to try to push people a little. Overall I liked the effect but I want to go back to regiments as units and basically adapt my old Hearts of Tin rules. 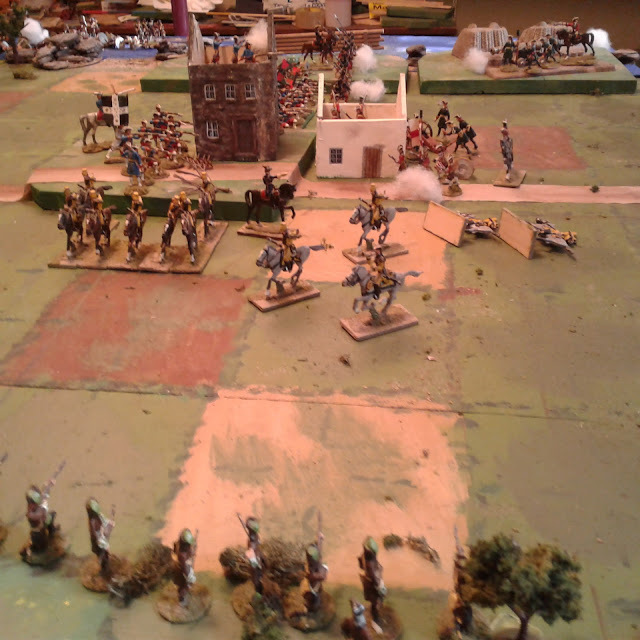 Gratuitous copy of a picture from last summer's ACW game. Before going On Grid I used to use variable length moves and I am going to go back there as well as using a turn initiative card deck with chance cards. 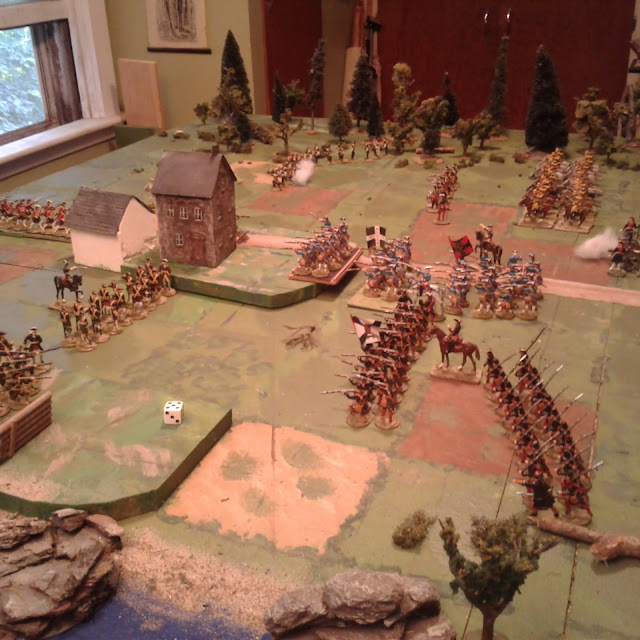 Each regiment or formed brigade will roll its movement dice and complete its move before the next one rolls. Here are a couple of the command ideas that I am contemplating. a) Brigade move. Two or more regiments formed into a Brigade line or column with Brigadier attached will roll once for movement of the whole line which must then move together. b) Generals have a short range at which they can boost the movement of one, two or three individual regiments by adding a die depending on their ability. These dice may alternately be used to boost morale or combat performance if not used to boost movement. Choices! c) Getting a brigade formed up requires the guide regiment to stand still. d) Once a brigade is engaged (however that is defined, 3" for close combat but perhaps rifle range for command control purposes) it should be difficult to coordinate a voluntary disengagement or a pursuit. If engaged at the start of a turn any retirement moves must be one regiment at a time and the unit must move the full amount rolled but may roll just 1 die if desired. If pursuing each regiment rolls and moves one at a time and must move the full amount as above unless storming a fortified position. e) Generals who get involved in any way inside the engagement zone must be at risk somehow and there should be a delay before a replacement takes over. Cobb's Farm from 2012. A game where the old C&C rules played their part. That's as far as I've gotten. The next step is to dig out an old version, check them over, adjust and try it all out. 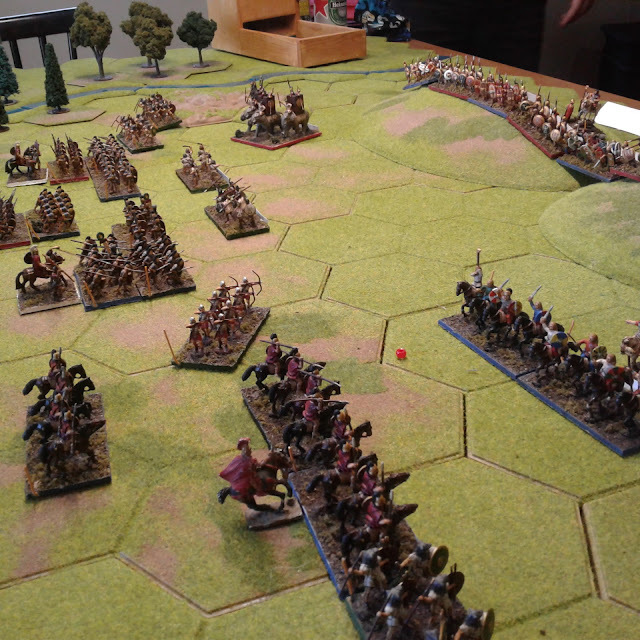 Something New Played - 20mm Punic Wars! On Saturday I joined 2 friends for a 20mm Ancients game using Sword & Spear. 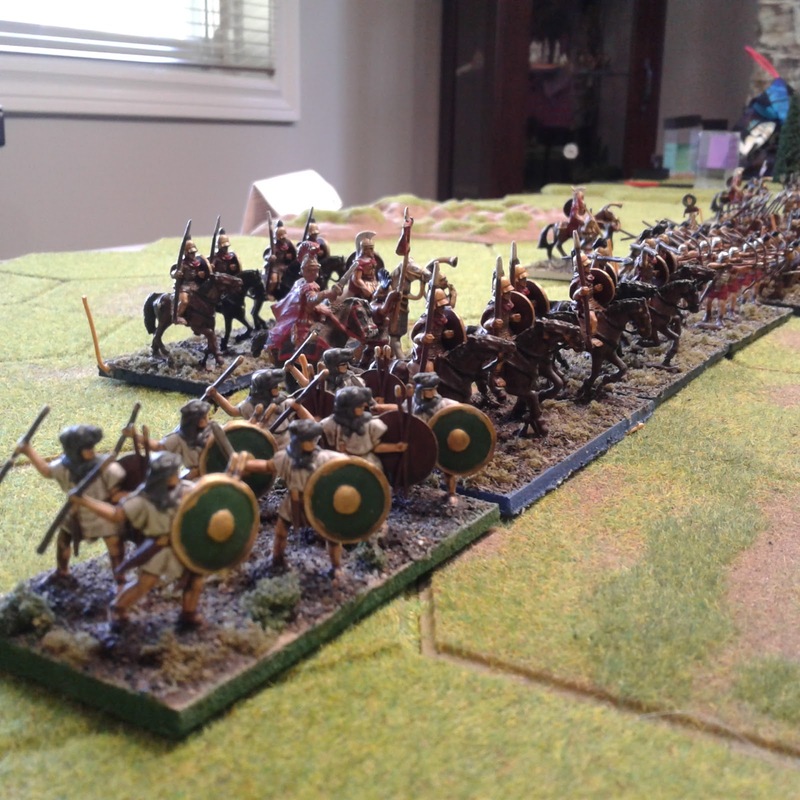 I cut my teeth on 20mm Ancients but its been a long time since I've seen a table full of them. Newline metal and various plastic miniatures. This was my first exposure to the Sword & Spear rules. Like most rules, they had somethings that I liked and some that I was less keen on. As a game I had no quibbles at all. They are designed to keep both players actively engaged at all times and succeed well. One game is not enough to properly judge but in broad terms they did seem to encourage broadly historical deployments and battle plans. Most importantly it was a fun and engaged afternoon of social gaming. My one quibble, and it may be that I've missed some subtleties, is that, like most ancients rules, there was no feel of the primitive nature of most armies command control mechanisms or of rigidity and importance of battle lines/phalanxes. Yes, there were 'beyond command radius' penalties and a very limited group move option when not attacking, but I suspect that it would be hard to do a good reenactment of an historical battle without a lot of voluntary fudging. A rather timely reminder since I'm about to back up and refresh my own Shock era rules which, frankly, would deserve the same criticism. Overview just before the first Shock. Its a good thing that assembling the sort of well ordered, well painted armies that our host provided takes a lot of work because the sight of them was almost enough to give me an urge to go back there and do it right this time! Obviously time to get the lads in Blue and Grey out to scratch the 20mm itch! 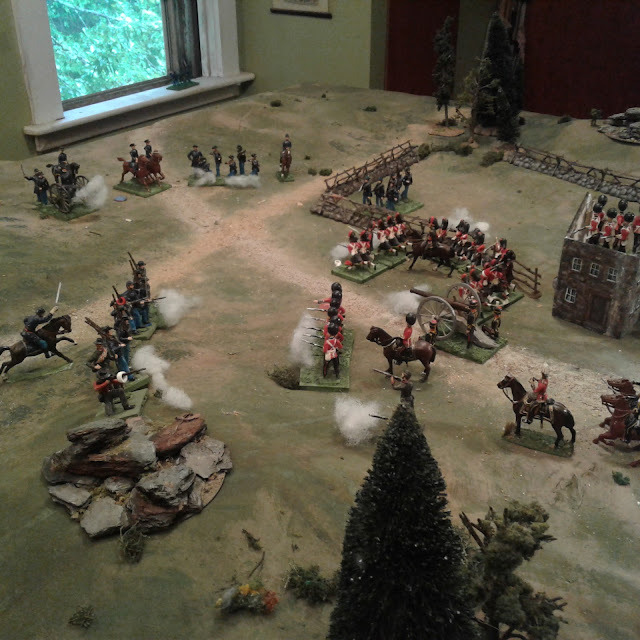 For more pictures and a report on the actual battle please see Jeff's Armchair Commander blog. Well, I've reached an impasse with my Prince August collection and the new campaign. I replayed the scenario with Charge! as written. It was an ok game but only lasted 5 turns so not many decisions to make. For reference, on an 6×4 table artillery could fire 6 feet and cavalry charge 2 feet. My 2/3 strength infantry units were almost 2 ft wide and the Rosmark force only had 5 units including the battery of artillery. Rather than continuing to spin my wheels over decisions about rules, organisation and basing, or make a hasty decision that I know is wrong, I'm just going to bring my NQSYW Rosmark units up to scratch for now. This will involve bringing my "away' army at least up to proper establishment over the next year with a consistent style and with all cripples and misfits pensioned off and replaced. I can still draw detachments for fighting the occasional skirmish so nothing is lost. I'll delay any other decision until the British are released. In the meantime, its time to get something different on both my painting desk and my gaming table . Mid-summer is not the best season for testing wargame rules here, especially not with games designed to happily last a few hours. Its just too damned hot in my games room from around 10 until 6 and there are too many other things needing to be done. But after several days of one or two turns a day I'm done. About 4 turns in. Reinforcements have arrived and been deployed on both sides and a bold cavalry charge has cleared off 1 unit of Rosmark light infantry. The big gun (which is the primary target for Rosish forces) has been manhandled out of the entrenchment and aimed at the enemy. Several things became abundantly clear however. The first, already known, is that changing several key rule mechanisms several times during a game makes it next to impossible to asses the game as a whole even while allowing a good comparison of the "feel" of each approach. The second, also known, is that while some mechanisms don't work, others are merely a choice between two valid approaches which deliver a different "feel" to the game. A slightly earlier overview of the armies deploying. At times I wondered if I should just give up and play Charge! or seperate the two projects entirely but a large part of me wants this sort of rules for these figures and this campaign and I want it to work on this table and without losing my compatibility for those joint convention games so the die is cast. Late in the day the Grey Squadron of the Yellow Hussars are broken by an exceptionally stubborn bunch of Wild Geese. Its a little hard to see but the Pandours brushed aside the Veteran militia without even breaking step. Only a halt by the Cautious Pandour Brigadier prolonged the game to 10 turns. Luckily the game felt just right at points so I'm on the right road. A bit of history, a bit of storytelling and a bit of toy soldiering. Well, I tried but it never even made it to the tabletop. It has long seemed to me that the number of times that an attack was halted or a defence quickly broken by a single long range volley or two are so rare or so low a percentage that they are best not catered to unless using very complex rules. My efforts yesterday were listing heavily towards complex to the point where their character was lost. First I fell back on the 2015 version which only tested if below 50% but was still having trouble getting the balance right and found myself harking back to Morschauser's three inch melee zone which nicely differentiated between attrition by long ranged fire and sudden death by close combat whether by volleys at 3" or my cold steel. Then I found myself reviewing reasons why I couldn't go there with a renewed MacDuff shorn of its rallying figures. They basically boiled down to "because". More of this sort of thing is what I want. One of the original concepts for MacDuff was that, like Lawford and Young's Charge!, there would be no separate reaction tests to determine how troops would respond to receiving casualties. If defeated in melee or below 1/2 strength you retreated. Of course I watered that down by allowing units to attempt to rally hits, essentially a delayed saving throw of sorts although I didn't see it that way but rather as a process of regrouping. 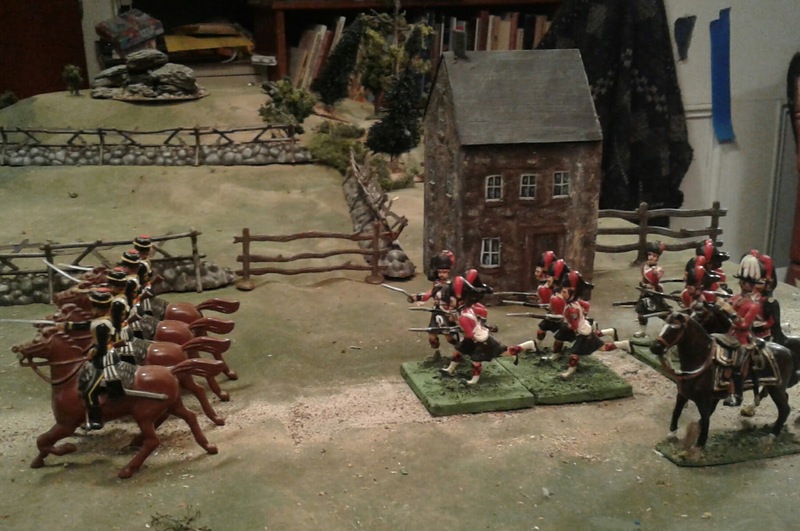 In 2014/15 I experimented successfully with replacing the rally rules by simple morale rules based on some of the ones in Featherstone's Battles With Model Soldiers. It worked game-wise and had roughly the same effect with much less time and effort. "Test if receiving at least 25% casualties from shooting. 1,2,3 Wavering. Infantry halt in disorder and return fire if eligible, artillery is silenced for a turn, mounted cavalry retreat. 0 Rout. The unit breaks and is removed. -2 @ Below 1/2 strength." 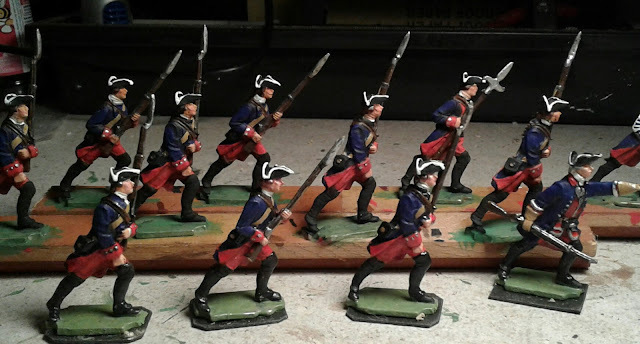 In the meantime the last 8 figures for the Rosmark Provincials are on my painting desk. Archive footage from a MacDuff game from 2012. These lads have just been recruited into the First Provincial Regiment of Rosmark. Unlike the Household Regiments which are largely recruited from abroad, the Provincial regiments are raised in each province and provide garrisons for its fortresses and towns as well as providing troops to assist Customs Officers and Magistrates. They even provide a service battalion for the King's field army if called upon in time of war but traditionally only for service in Rosmark. Rosmark First Provincial Regiment in training. The moulds poured well with few faults but once I started cleaning up the castings, I found an uneven number of poses amongst the good figures. I'll have to even it up with the last batch. Then I primed them and noticed the mustaches. Oh dear. So I scraped the faces and reprimed, not perfect but I was in a hurry to get started painting, hoping to finish before I went away for the weekend. Things just continued from there with all the sorts of little errors and difficulties, awkward angles, missed bits, stray brush strokes etc that can occur. Anyway I ended up putting them aside until I got back and finished them today. Not exactly my best work ever but they'll serve. Now to cast 6 more with the right mix of poses to have a 16 man unit with rear rank supporting arms and front rank charging. 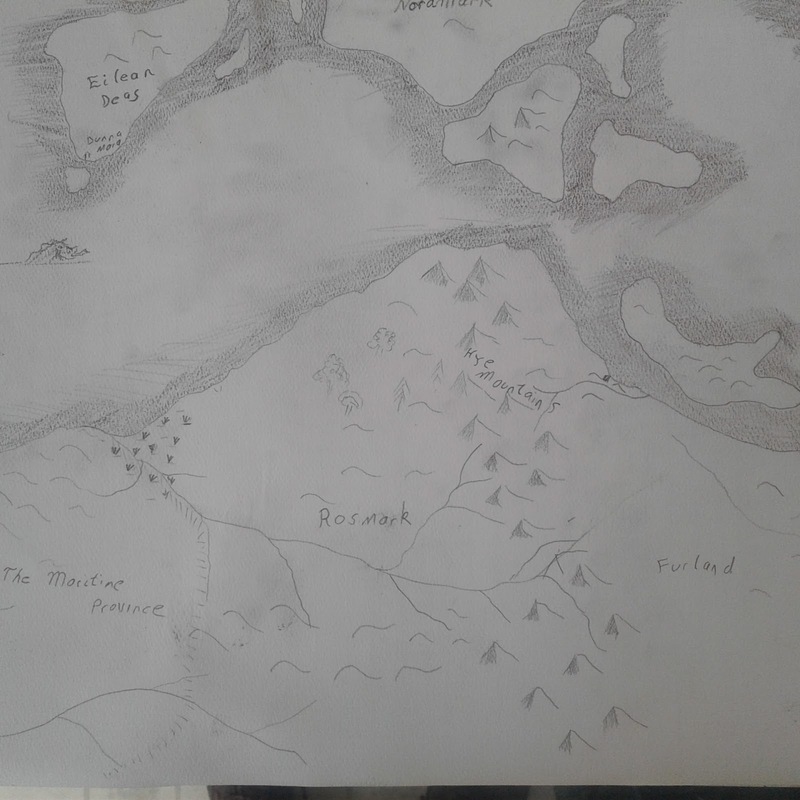 Barely begin and a long way to go but here is the current state of my NQSYW map. Simple pen on paper, a process that I'm quite enjoying. It looks like I will have to do blown up local maps if I decide to make actual campaign moves rather than using it for general background, but, first things first. Happy July 4 to my friends and neighbours who live South of the Border. 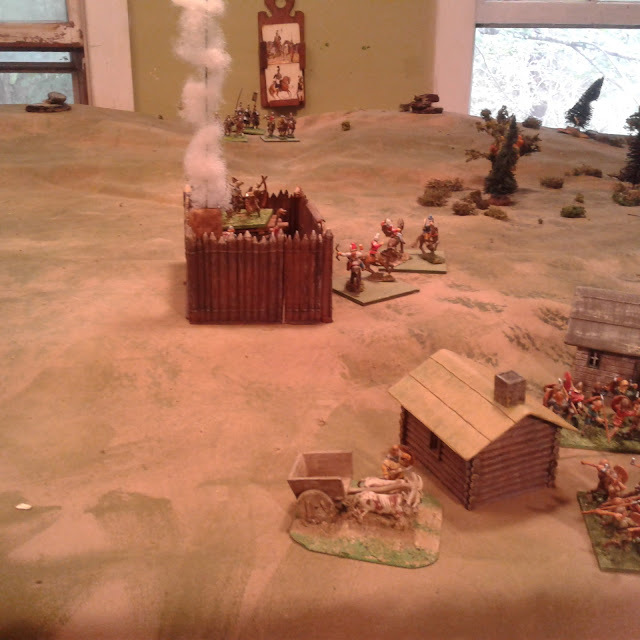 Waves of Yankees attacking through a cornfield. OK, sorry folks, this is fake news. I was tempted but the danger that I would squish the Squash etc behind me was too great. One of these days though, I 'll go outside on some freshly mown grass, get down on my knees and play. Well here it is, another 4th of July, seven years since my heart attack and still ticking. I get a bit more embarrassed by the fuss each year but then I hear that the folks south of the border are again organizing parades and concerts and making a holiday of it so I ought to be able to manage a blog post at least. In honour of the 4th of July here are some ACW troops defending a Musket Miniatures Rock and Wood fence. I assembled and painted it up over the 2nd & 3rd. This last year has been a good one by and large but an odd one. I think the last time that I passed a year with so few stressors and changes was probably when I was 11. Still, we managed and I'd be up for a repeat. Gaming-wise it has been much the same, a bit of consolidation including small expansions of existing collections and I expect that to continue with at least one "proper" campaign. The Musket Miniatures fence before painting but after assembly. I quite like them but at roughly CAD$1 an inch I won't be covering my table with them. Wouldn't mind some corners though, and another section. However, I think the 25mm fantasy/medievals are coming back. The 40mm version was ok but while a good imagination should be able to merge the variety​ of periods that my collection of Elastolins includes, the mix is insufficient to produce coherent armies for battles without a lot of work, work I don't want to do right now. I also miss Prince Michael so I will revert to the original​ plan with a 40mm Elastolin Heroic Dark Age skirmish setting with single figures and a Medieval Fantasy 25mm battle collection. The longbowmen, pikemen and plate armoured knights will then remain dedicated to the 16thC Rough Wooing collection. I currently have an excess of Prince Valiant Elastolins so will consider looking for a new home for a few of the quadruplicates. So that's about it steady as it goes until ambushed. But...maybe, just maybe, this might be the year I get my room tidied up, cupboards and shelves organized, finish getting existing units onto matching bases, fix up my battered terrain and add to it? 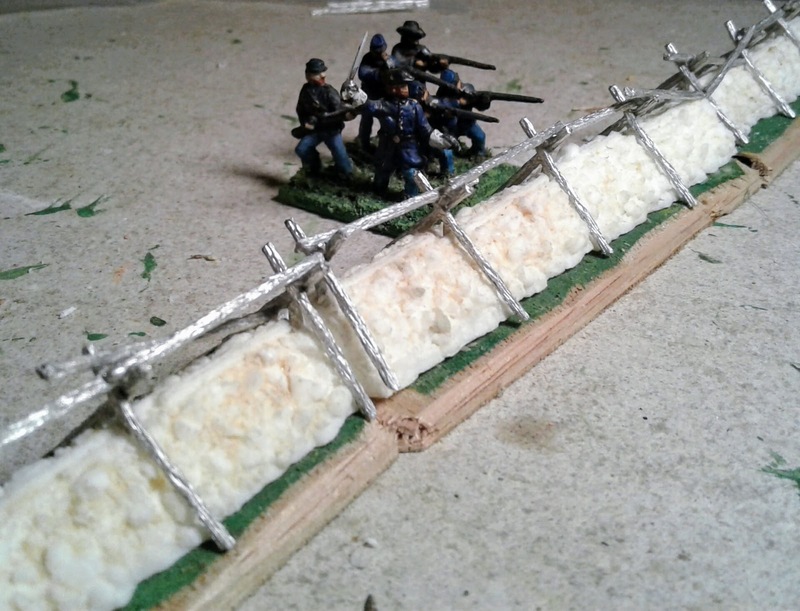 Yah, probably not, but I did finally paint up a stone wall for my ACW guys! 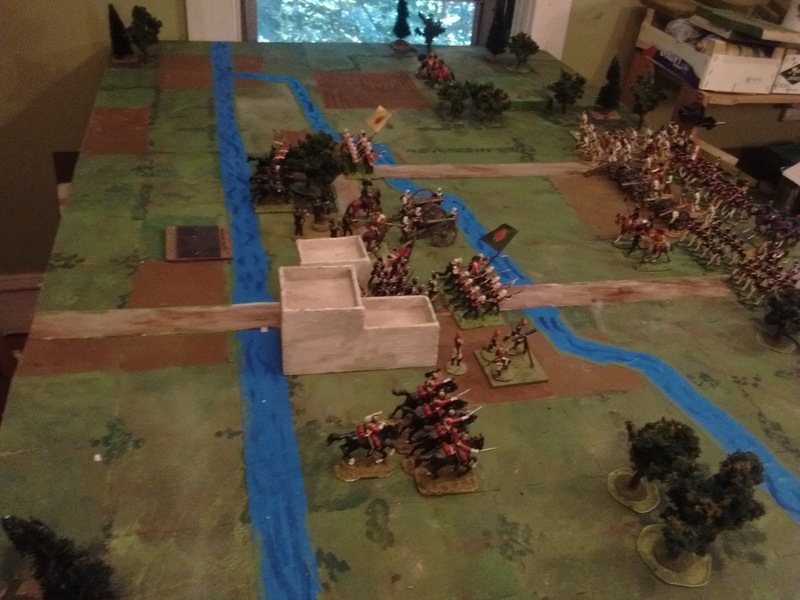 There I was, a rainy Canada Day holiday, what was there to do but play a patriotically themed wargame and what's more patriotic than defending your border against your neighbours? So, Eighteen Sixty-Something, somewhere in the Eastern Townships of Quebec. The 5th Royal Highlanders arrive to support the Princess Louise Hussars. <<Disclaimer>> OK, for those new to my blog, we are playing fast and loose with history, the Canadian Black Watch were still Light Infantry in shakos and there was no invasion by US army units etc, etc. Its a game with toy soldiers. The table, minus buildings and troops was still up from last game so I decided to just tweak it and play a straight encounter with the armies entering on one or both of two roads based on die rolls. My Chromebook is in the shop and anyway I haven't finished the revision of Hearts of Tin so I just winged the rules based on instinct and memory. 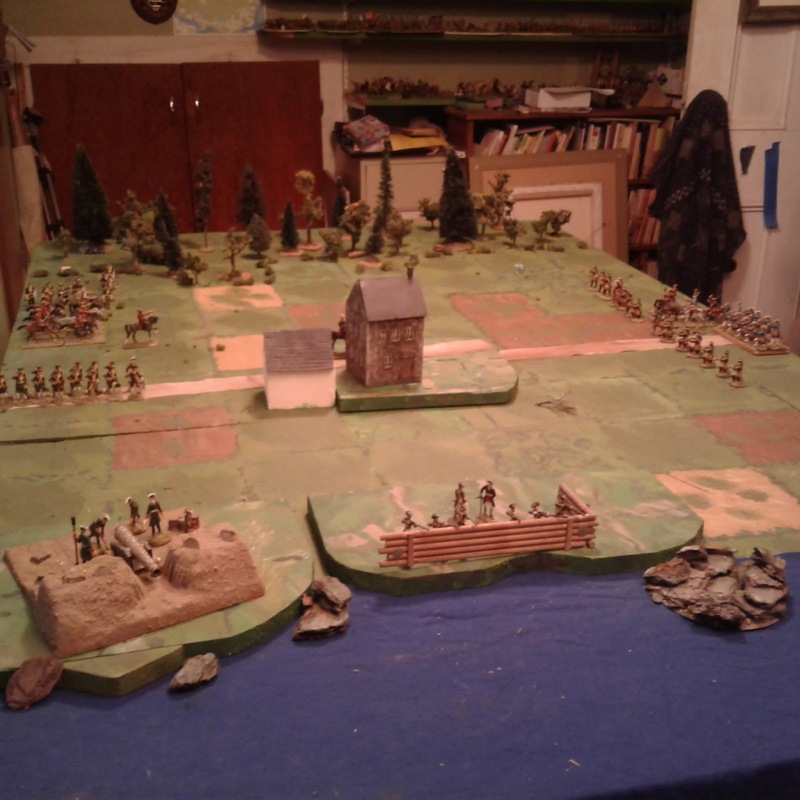 A wider view of the table as the armies march on. 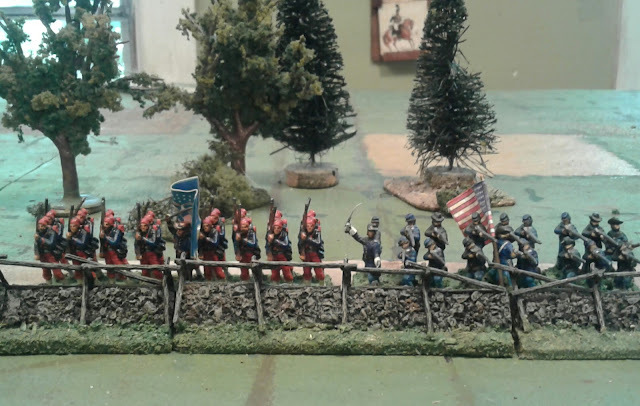 The US was able to muster 10 stands of infantry which I divided into 5 "units", 2 stands of cavalry, a gun and a stand of sharpshooters along with 3 Commanders so I matched it with Canadians and got to it. The infantry could take 4 hits per stand, the rest 3. A "Brigade" losing 1/2 of its stands would have to test each turn that it took hits: 4,5,6 carry on, 1,2,3 fallback. An army losing 1/2 stands must retreat. The side controlling the crossroad at the end of 15 turns would win. Initial honours are fairly even. 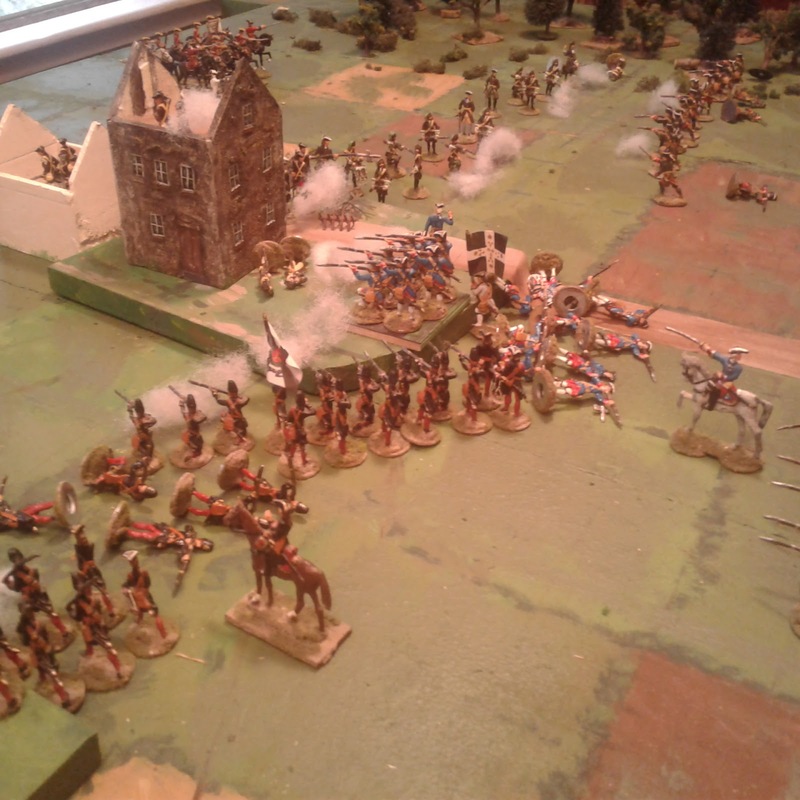 An early charge on the Hussars by US cavalry supported by artillery fire inflicted the first stand lost but since both sides had to rally back the Canadian infantry filled the gap and started to shoot up the unsupported battery. As more units arrived the fighting spread and developed into a prolonged firefight with neither side seeing an opening for a decisive assault. By turn 8 the Canadians were having the worst of it and our correspondent was starting to wonder on the tone for a report on a Canada Day defeat. The day was not over yet though. 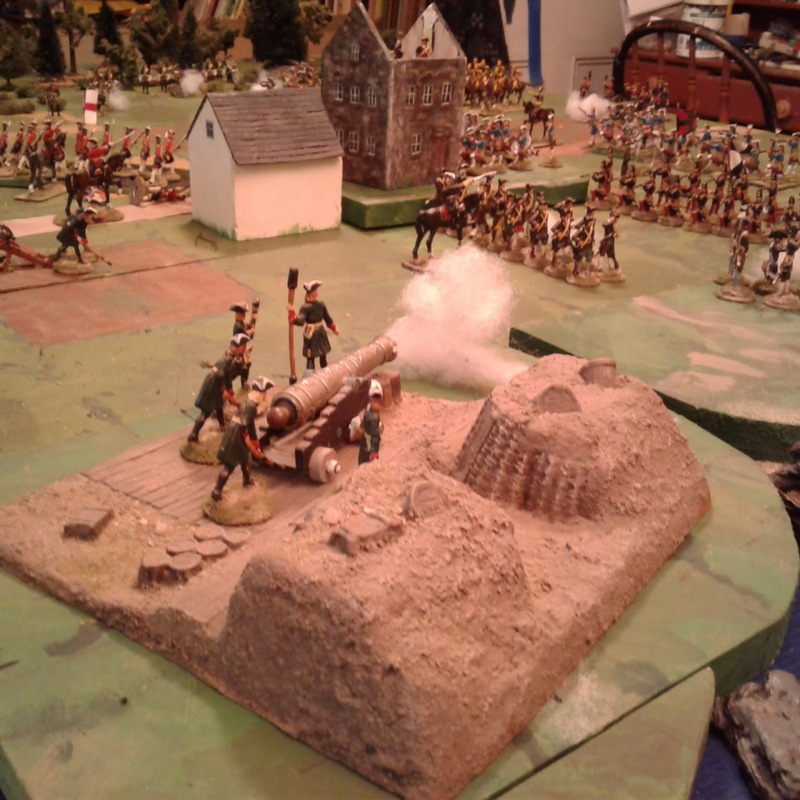 The Canadians focused their fire on the American gun and drove it back. ( or drove it back, it depends on whether or not a version of the Give Ground rule from the Square Brigadier is adopted. ) They then pulled back from a salient in the center and focussed on the American right. Fortuna smiled on their dice and frowned on the invaders to keep the averages level. 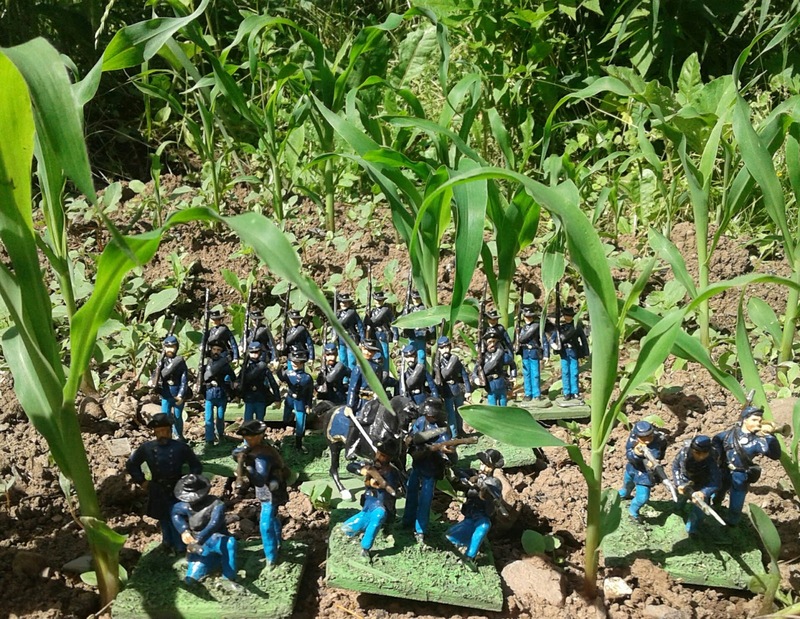 Stand after stand of Boys in Blue fell and the American commander was unwilling to pull back from a firefight which should have been equal and unable to think of any daring manouver to retrieve the situation elsewhere. Finally on turn 13 the Yankee line collapsed and they were forced to retreat. The final tally had been 7 stands lost vs 5 so a near run thing. Work on the rules will continue whem my Chromebook comes home or I buy a bigger tablet. I'm not sure which to hope for.